« What Would You Choose As Your Last Meal? 1. Boil brussels for 5 minutes. Drain ans set aside. 3. Add olive oil. Add brussels sprouts and cranberries. Toss around for 2 minutes. Season to taste. 4. Garnish with candied lemon zest. posted by jessica	at 01:38 PM	Filed under Inventive, Recipes. You can follow any responses to this entry through the RSS 2.0 feed. Both comments and pings are currently closed. Wow, these look amazing! 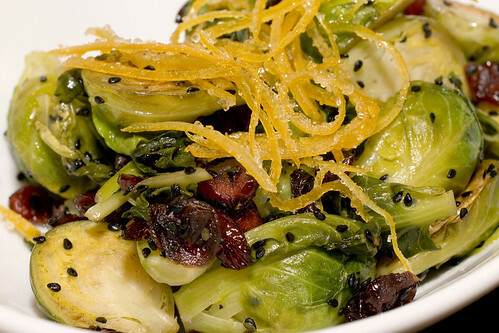 I love brussels sprouts, I’m always looking for new ways to make them. You had this one up your sleeves the whole time when you made the lemon zest! With the cranberries, that’s a sweet bite to go with the brussels sprouts. Great idea. 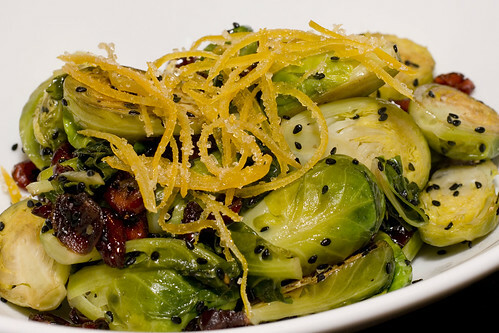 This is a really nice way to serve brussels sprouts! Thanks Jim! I’ll have “tech support” look at it.